Built in 1954, Alliance Homes are located in close proximity to Eichler Homes in San Rafael's Terra Linda neighborhood. 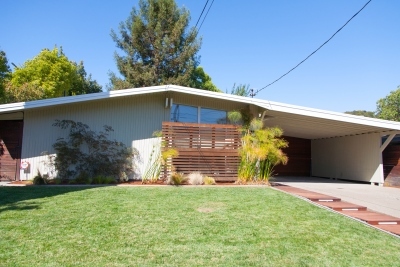 Alliance-built homes closely resemble Eichlers and are sometimes referred to in jest as "Likelers" because of their familiar, Eichler-like appearance. Alliance Houses bear many of the trademark features of mid-century modern ranch homes including post-and-beam construction, open floorplans, floor-to-ceiling glass, architectural pitched rooflines, and in-floor hydronic radiant heat (with copper piping which is more desirable than steel piping found in many Eichlers built around the same time). Alliance houses do not have atriums or courtyards which are common with nearby Terra Linda Eichler homes. In terms of design, Alliance homes seem to share more design similarities to Cliff May ranch homes which are common in South California (but can also be found in the Novato area of Marin County). Just over 200 single-story Alliance Homes were built in San Rafael in the mid-fifties. Alliance-built homes are located across several streets in Terra Linda, with most Alliances located on Holly Drive, Hyacinth Way, Hibiscus Way, Hickory Lane, Las Colindas Rd, Las Pavadas Avenue and Whitewood Drive. When touring this Alliance housing tract, a good starting point is the intersection of Hickory Lane & Hyacinth Way. San Rafael Alliance Home Alliance floor plans typically have an "L" shaped layout and consist of either 3 or 4 bedrooms, 2 bathrooms plus fireplace. The average square footage of these homes is just under 1,500 which is slightly small than most Eichlers in the surrounding community. Contact us for experienced representation when buying or selling an Alliance-built home or Eichler home.